Luke Weil gives readers an up-close look at the strategies he has used to generate such immense success as a blogger. After starting off with just a small blog and no clear monetization strategy, Weil’s blog became such a sensation that he was able to make a career out of the platform he created merely as a hobby. Even though his initial success came almost entirely by accident, Weil has since created a host of other wildly successful blogs while consulting countless others on how to generate significant streams of revenue through blogging. 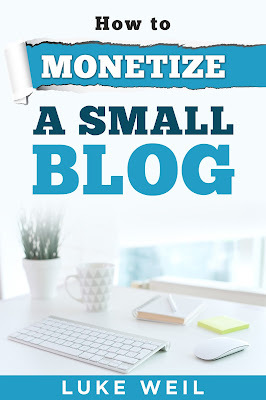 In his book, “Luke Weil's How To Monetize A Small Blog,” Weil takes the reader through the various options available to bloggers and explains how to best determine the right choice for a specific blog. Taking a nuanced approach that offers a complete view of every available monetization strategy, Weil’s book provides readers with all of the insight they could possibly need to make informed decisions regarding the development of an overarching monetization strategy. An especially valuable book for beginning bloggers, Weil’s explanations are clear and concise so readers that may be largely unfamiliar with the world of blogging will feel quite confident as they make their first foray into the valuable online platform. I love blogging and I have been doing it for years. I first starting blogging while I was pregnant with my second son. I was planning on being a stay-at-home mom and wanted something I could do while staying home with my kids. I really wanted to monetize my blog in order to make a little money on the side. I wanted to feel like I was contributing a bit to the household, money wise. I don't make a ton of money, but I do okay and like I said, it's nice to have something to build and do in between taking care of my children. This book was not for me. I already knew most of what I was reading. However, this book is probably better for the beginner blogger. The book is 33 pages long with larger print and huge margins, so it was an easy read. It's more of an overview on ways to monetize a small blog. Nothing really specific, just general and basic information. Overall, if you're a first time blogger and have never monetized a blog before, than you might find this book useful. If you would like to grab Luke Weil's How To Monetize A Small Blog for yourself, you can purchase it right now from Amazon! Disclosure: I was not financially compensated for this post nor was I required to write a positive review. The opinions are my own and based on my personal experience with the product. I received one of the product mentioned above at a discounted rate for my unbiased and honest opinion and was not compensated in any other way. Regardless, I will only recommend products or services I use personally and/or believe will be good for my readers. Great post! Glad you liked the book.